Forget all this talk about giant “spending cuts” of $6.2 trillion in Congressman Ryan’s budget plan. That’s music to my ears, but it’s also based on Washington’s bizarre budget math – i.e., the screwy system where politicians can increase spending but say they’re cutting spending because the budget could have grown even faster. What really matters is how much money government is spending this year compared to how much money will be spent in subsequent years. Using this common-sense benchmark, let’s look at two competing proposals. According to the new numbers released today, Congressman Ryan’s budget plan will result in government growing, on average, by almost 2.8 percent annually over the next 10 years. President Obama’s budget plan, by contrast, would increase the burden of government spending by an average of nearly 4.7 percent each year. This chart compares the two budget plans. Because Chairman Ryan does not let spending grow as rapidly, cumulative spending over that period will be $6.2 billion less than it would be based on the President’s plan. That’s an impressive amount of money that taxpayers will save if Ryan is successful, but it’s not a spending cut. Not surprisingly, the big spenders in Washington are claiming that the “spending cuts” in Representative Ryan’s budget are “harsh” and “extreme.” But Ryan’s proposal would allow the budget to grow faster than inflation, which is projected to average less than 2.1 percent annually over the 10-year period. That’s exactly what happens with Ryan’s plan. By 2018, the federal budget will drop to less than 20 percent of GDP. That still doesn’t bring us back to where we were at the end of the fiscally responsible Clinton years, when federal spending consumed only 18.2 percent of GDP. 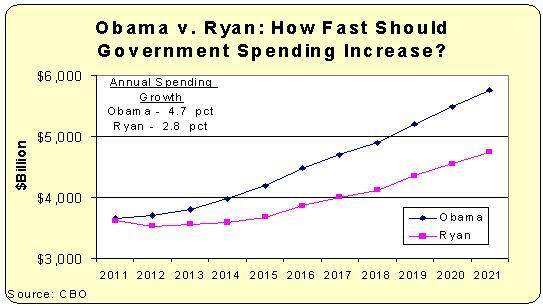 But after a 10-year spending binge under Bush and Obama, Congressman Ryan’s plan would move America back toward fiscal responsibility. It\’s raelly great that people are sharing this information. PAUL RYAN/ DONALD TRUMP CANDIDACY FOR 2012! Hey mom why dont you tell Obama to stop giving the wealthiest 1 percent tax breaks. Like Geroge Soros who got 2 bilion dolars to drill for oil in brazil or GE who didint even have to pay FEDERAL INCOME TAX the list goes on and on. The problem with all you left wingers is you dont have the facts. Obama is giving the unioins tax and healthcare breaks and i dont see that being talked about. All you can say is the republicans are kiling children women and the elderly by wanting to cut federal spending. If we dont decrease the size of goverment we will all be killed off by Obama’s healthcare plan. Please learn to blog intelligently and use facts not baseless REHTORIC. Let’s consider taking care of US as opposed to funding every country in the world to further our supposed interest for the sake of National Security. Do we need billions spent to keep our armed forces in Japan, Germany, and the many countries we consider allies?? Do we need to have the Government owning some of the most prime real estate in the world?? When the American citizen has a financial problem they are force to liquidate assets to cover debt, unless the government bails them out but only if your big enough to be considered worth while. On the other hand if your small enough then our welfare system will step in and help. What about the millions that are in between large and small?? We know that answer; don’t we!! on April 6, 2011 at 10:00 am Sean L.
The fact of the matter is, if government stuck to what it’s supposed to be doing, rather than trying to do everything for everyone, we wouldn’t have a revenue problem. When no amount of revenue will fix the problem, that pretty much proves it’s a spending problem. Taking Mr. Mitchell’s numbers of 4.7% vs. 2.8% growth in government spending at face value (has Mr. Mitchell accounted for interest payment growth in the 4.7 and 2.8% figures? ), the Ryan plan barely stabilizes the Economy since stabilization assumes that the US will grow at a 2.8% annual average. Seems possible, since the historical average has been around 3% growth, though the strong productivity disincentive of Obamacare alone (i.e. reduce your personal production below 60-80K and taxpayers will pay your healthcare costs) is likely to undo most of the incentives in the Ryan plan and thus makes the historical 3% annual growth expectation very-very iffy. Obviously the Obama plan at 4.7% spending growth mathematically leads to rather quick self-destruction, since there is no way in hell that the US economy will grow at 4.7% annually under the new welfare complacency and productivity punishment policies of ObamaCare, Carbon Taxes, perverse expensive Green Energy subsidies and other dis-incentivising and innovation stifling redistributionist and central planning policies (hell, we were growing at 3% before even all that got implemented – a healthy but not stellar growth). So the Obama plan will mathematically lead to significant tax increases soon, which will then trigger a new round of slower growth, then a higher deficit, then even higher taxes, then again even higher deficit,… until the whole thing unravels in 3-4 iterations (i.e. 3-4 election cycles) – and that timeframe assumes that creditors will maintain their absolute confidence that American taxpayers will certainly pay back full principal and interest before their government bonds mature and thus acquiesce to being satisfied with the low interest rate the US pays on its bonds. But chances are that the confidence of creditors will start declining sooner rather than later so the whole thing seems to me more likely to unravel within 2-3 election cycles under the Obama plan. Needless to say that after even just 4 more years under the Obama plan the situation is likely to become irreversible no matter what successive administrations do, who gets elected, Republicans or Democrats. On the way down, the rich will get punitive tax rates and the poor will get indirect and direct excise taxes and VAT (because there just isn’t enough wealth and oomph within the rich to keep feeding this level of government spending so the middle class and poor will have to be tapped to feed the collective machine sooner or later). So the summary is: Ryan plan = US Barely survives. Obama plan = US declines quickly. …so that government spending growth is somewhere in between, say around 3.8% under the backdrop of long term annual growth in the 2% range (and a worldwide average growth of 4.5%) a definitively declining but not precipitously ruinous path. The decline will be long enough (~20 years) for enough people to forget how America was and how it is, and give people enough time to adjust to the new European-like low motivation reality. Again, on the way down, the rich will get punitive tax rates and the poor will get indirect and direct excise taxes and VAT. Perhaps the only ironic hope is that this scenario will also be unstable since major destabilizing events are likely to take place along the way – like the unraveling of Europe. Europe is now being fast marginalized on the world stage (the French bombs in Libya are the desperate attempts of a declining continent to re-assert itself albeit temporarily) and its decline may not follow a quiet path and its disintegration may perturb America’s orderly decline. Well, just enjoy the ride. Might as well party while the Western Civilization boat goes down. E.g. come 2014, relax a bit, go into semi-retirement, drop your income below 60-80K so you can sign up for almost free ObamaCare and have someone else pick up your health expenses. Stop producing too much and finally spend some time growing those vegetables that the greens have been nagging you all these years to plant in your garden. Finally, take the advice of the socialists after all, “money does not bring happiness” stop contributing so much of your vitality providing goods and services to the consumer public when an increasing part of your day will be spent working for the government rather than you and your family. Just secure a lifeboat, because when time comes, the mood will shift quickly and everyone will rush to the other side. Make sure you are not one of the last ones left on the Titanic trying to restart the pumps in the bowels of the ship, because HOPE and CHANGE will keep claiming that any minute now she’ll finally float again if we can just endure the pain and turn the ship a little more left. The Orwellian Right would have us believe if the rich pay a bigger percentage of a smaller tax pie, they are paying too much… even if in inflation corrected dollars, Bush’s income tax revenues were LOWER than Clinton’s last year in SIX of Bush’s 8 years. This is the same game they played during the Reagan years… and no one’s smartened up. The truth is we don’t just have a spending problem… we DO have a revenue problem… and it’s about time the Tea Party idiots on Right dealt with reality. Pray tell, how can we be “over taxed” when since Reagan We The People have received some $14 TRILLION in government spending we REFUSED to pay for and are passing the bill on to our kids and grandkids? The Tea Party should be renamed the Free Lunch Party. At SOME point, if there is an ounce of patriotism in the Tea Party, they MUST deal with those on the Right who DELIBERATELY sabotaged revenues to force a fiscal crisis hoping it would kill New Deal and Great Society programs. If they don’t they will remain useful idiots in a class war waged by the right wing rich against the rest of us. on April 5, 2011 at 3:18 pm Sean L.
3) Nearly half of all Americans pay no tax at all. Why try to improve a business, or work harder, or invent something new and sell it if the government is just going to take most of it away? Think about it from your own perspective — Let’s say every year the tax collector knocks at your door and says, “I’m coming back tomorrow to take 30% of everything you’ve purchased in the last year.” What would you do? Would you just say, “OKAY!” or would you move that stuff into storage, or maybe to a house in another country that would only take 10%? If you had a lot of money the government was going to take, you would move into a place to protect it, too. You know you would, so don’t be a hypocrite. While it may make you happy in some weird way to “punish” the haves, it won’t generate more revenue. Since the 1940’s revenue has averaged about 19% of GDP no matter what the tax rates. People change their behavior – what the government taxes you get less of. The only way to create higher revenue is to raise the GDP. Those people who are encouraging you to have an “eat the rich” mentality are ignoring 80 years of revenue facts. It only serves to destabilize us culturally and takes us further from real solutions. We have to reduce governmental growth and intrusion that drags and/or stifles economic growth. Where are the variables making the chart? What happend to the revenue? why did we let the revenue go away (for example letting those making >$1M to get another TAX CUT!!!). If we are so broke, that we need to cut services and shutdown goverment – why don’t you stop the tax cut to thsoe whojust save theri money in banks and out of the country, + stop the salaries to those in congress and seante? These simple solutions will increase revenue and decrease spending where it wont really hurt anyone. Serf, you don’t appear to be a bright person. This chart is useless, since it doesn’t show where money is spent, geniuses. I don’t think Haliburton, Xe, or the TSA are necessary….I could draw a chart removing them from the budet, so what.